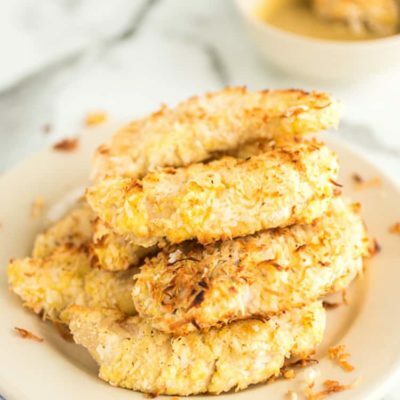 These Coconut Chicken Tenders have a sweet coconut crust baked onto tender chicken. 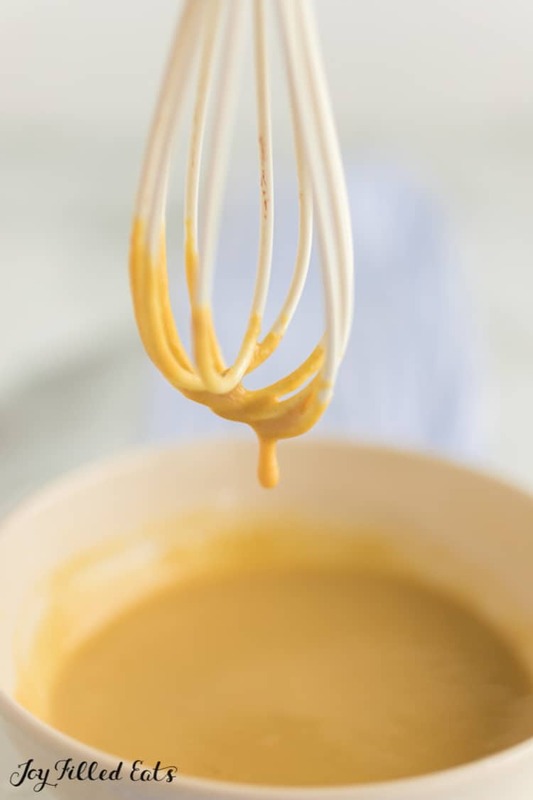 Dip into my sugar-free maple mustard sauce for an easy flavorful main course or appetizer. Behold a coconut chicken that is baked in the oven and packed full of vibrant flavors. 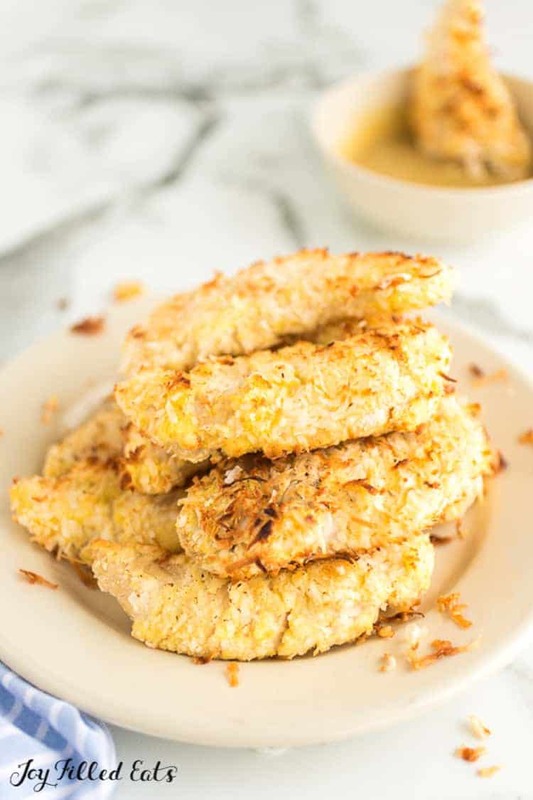 This coconut crusted chicken with maple mustard dipping sauce is low carb, dairy free, gluten free, grain free and THM S! A new family favorite in the making right here! Coconut chicken is my adaptation of coconut shrimp. Baked chicken is one of the easiest ways to cook up your chicken. 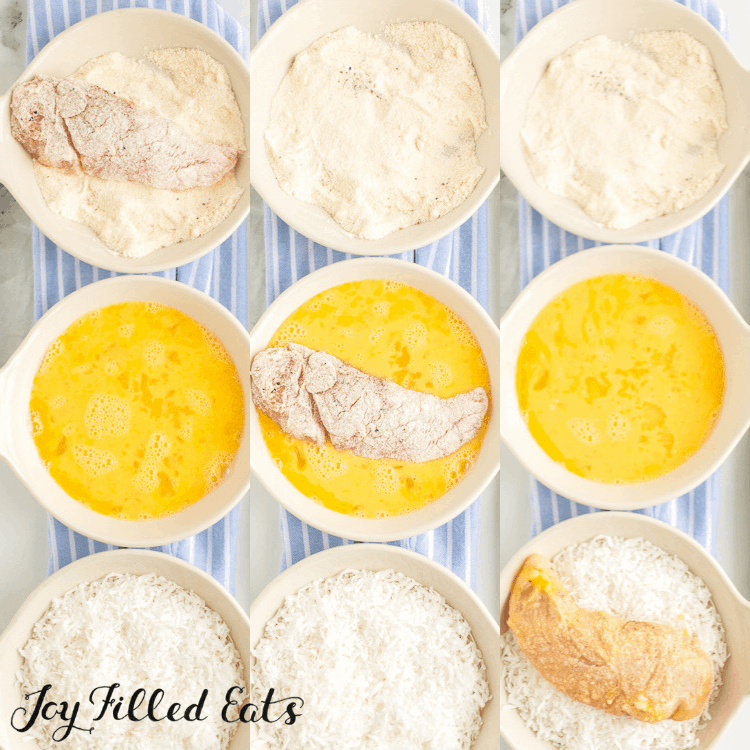 When you bread the chicken it helps lock in the moisture for a juicy and tender chicken! Add in the maple mustard sauce and it throws these tenders over the top. I really love breaded chicken. The coating helps the yummy sauces cling to it. Chicken parm, chicken piccata, chicken Francese, I love them all. But what I really love is coconut shrimp. Unfortunately, shrimp is rarely in our budget for regular dinners (we splurge of them for birthdays and date nights) so I thought coconut chicken would be a good compromise. Or a great compromise. Healthy, simple, and delicious down to the last crumbs! I wanted to create a simple recipe to help lighten up a traditional tender and give it that refreshing coconut flair. My recipe uses a mix of coconut flour, coconut oil, and unsweetened coconut. Each ingredient helps bring this dish together nicely. And you will find helps it to be gluten free and low carb. I reach for unsweetened coconut, so it makes it a less sweet dish. I find the unsweetened flakes give a nice flavor of coconut without bringing a lot of sweet to the table. If you want to add sweetness reach for sweetened. I know some people love that sweet and savory and that one tiny change would give you the result you wanted. But you will be adding sugar to this recipe if you use sweetened coconut. 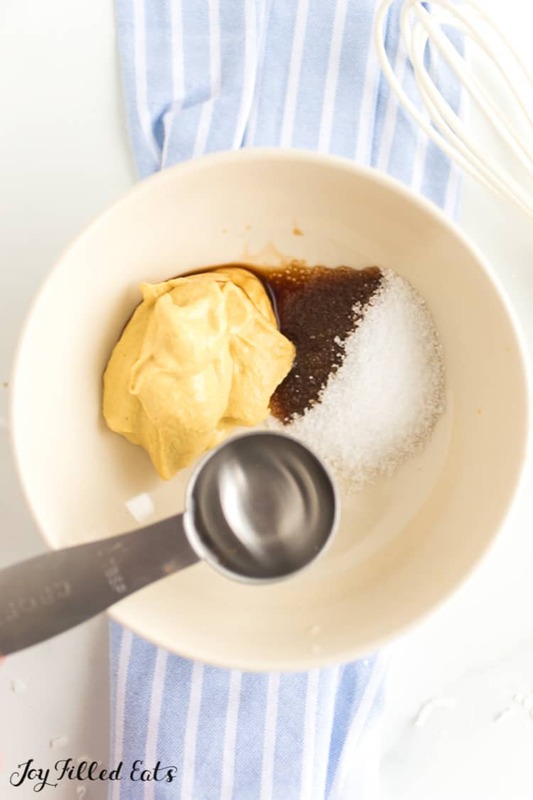 One way to get sweet flakes without sugar is to melt a low carb sweetener and then mix the melted sweetener with unsweetened coconut for that hint of sweet. That’s my low carb hack. I have found that using smaller coconut flakes help stick to the chicken easier. If you have larger coconut flakes just grab a knife and dice them up. Or toss in a sealable bag and use a rolling pin to help break them up. 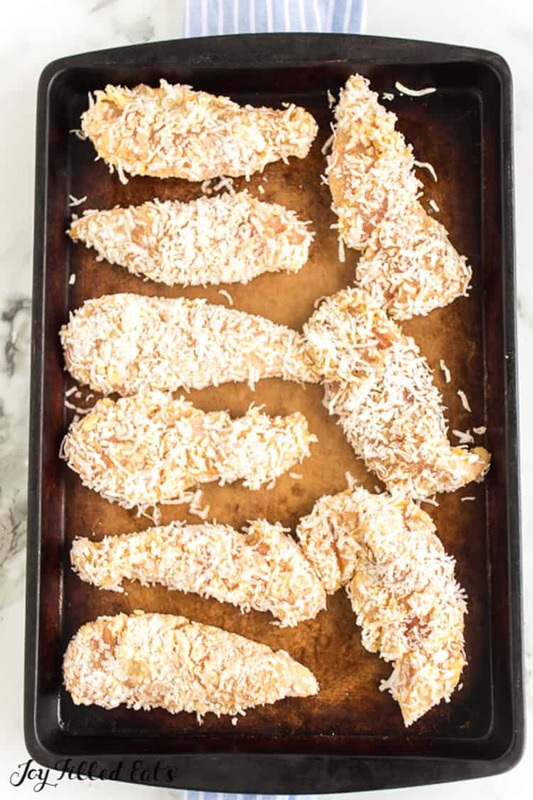 The smaller coconut flakes adhere so much easier and give you a more even coating over your chicken tender. For chicken, I say anything over three days needs to be tossed. 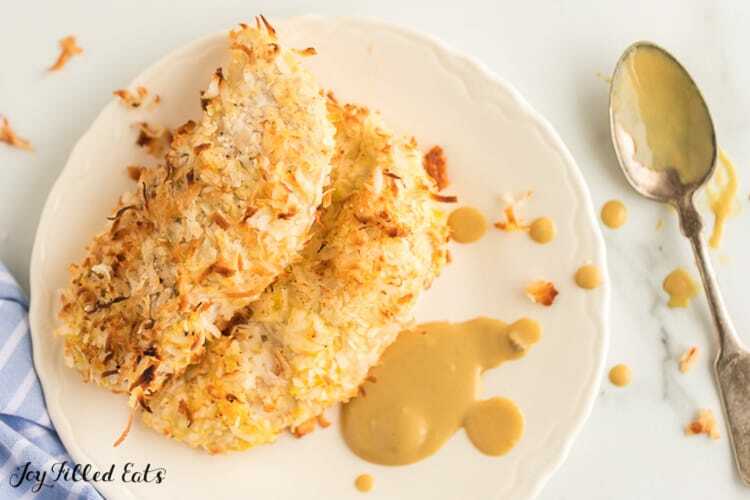 If you don’t think you will eat all the leftovers, see below how to freeze your Coconut Crusted Chicken easily. Get creative with how you eat it the next day. When I make this I always plan a loaded salad the next day and use the cold leftover chicken to get diced and top the salad. Add your favorite salad toppings and dive in. It makes it taste like a whole new meal! 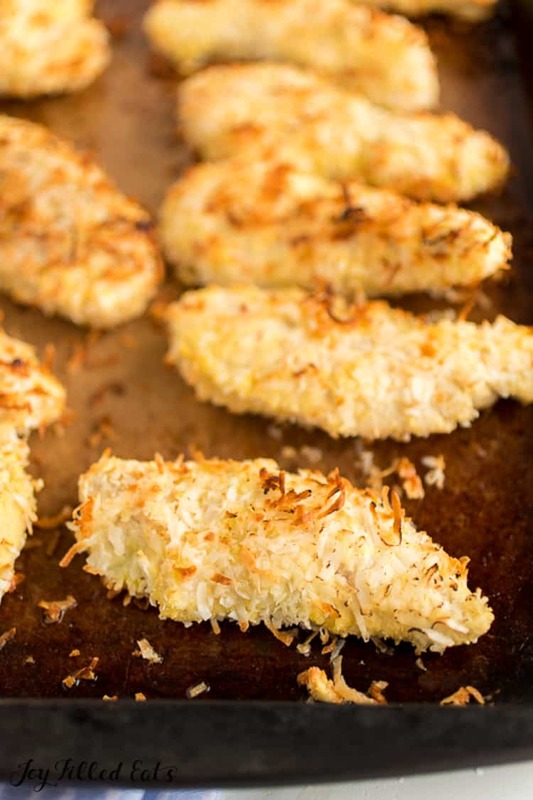 You can freeze coconut chicken tenders. Just allow your tenders to cool once you pull from the oven. Then place in a freezer bag and remove as much air out as you can. Or place in an airtight container and freeze up to 2 months. This is a wonderful option if you like meal prepping. You can use these tenders for quick lunches, dinner down the line, or after school snack for some added protein! When you want to reheat just toss in the oven at 350 degrees and cook until heated through. Whip up some more sauce if you want and dip away. The versatility of this coconut chicken is outstanding. Pair with my savory and sweet dipping sauce, too a salad with this chicken, and the list goes on. Pretty much any sides work next to your tenders from zucchini noodles to steamed broccoli and all things in between. This recipe right here is on our regular rotation at dinner. The whole family enjoys it, taste amazing, easy to prepare, and it feels like a treat. While it isn’t shrimp, it sure does make me forget about that coated shrimp. 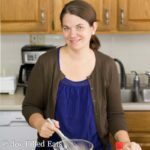 This is a kid-friendly recipe so see how your kids like it! I have seen no complaints from any little fingers that we have made these tenders for. Have you made homemade coconut chicken before? Preheat oven to 400. Put a few blobs of coconut oil on a baking stone or cookie sheet. Put it in the oven to melt and get hot. Prepare the ingredients to coat the chicken. In one bowl beat the eggs. In a second bowl mix the coconut flour with the salt and pepper. In a third bowl put the shredded coconut. To coat the chicken: Coat a piece of chicken with the coconut flour, then dip it in the egg, then coat with the shredded coconut. After that put it on a second baking sheet while you coat the rest of the pieces. When all the pieces are coated remove the hot baking stone from the oven, spread out the coconut oil if necessary, and carefully put the chicken on it. (Preheating the baking sheet helps the chicken get a crisper coating). Put it back in the oven and bake for 10 minutes. 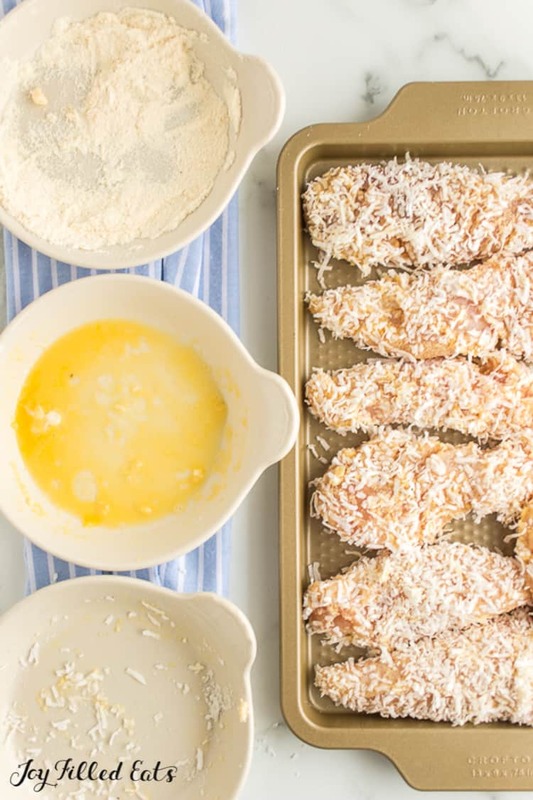 Flip the chicken over and put a few more blobs of coconut oil on the baking sheet. At this point my chicken was 150. Turn the broiler on high and put the chicken back in the oven. Do not leave the chicken unattended. I sat on the floor in front of the oven to watch it brown. When the first side was brown I flipped it one more time to brown the other side. It is worth the extra flipping to get a crispy coating. It only takes 2-3 minutes per side. Originally Published February 17, 2016. Revised and Republished February 6, 2019. I am anxious to try this one! I am thinking of grinding up the coconut a bit since I have some family members that aren't huge coconut fans! These are simply fantastic! 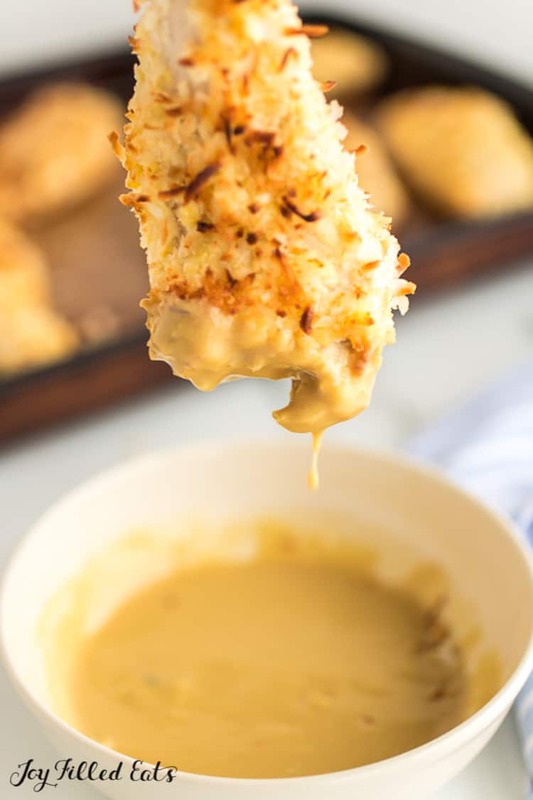 A great healthy option and the dipping sauce is a perfect pairing! Thanks! I've just started on a Keto journey so these look amazing!!! I can't wait to try them!